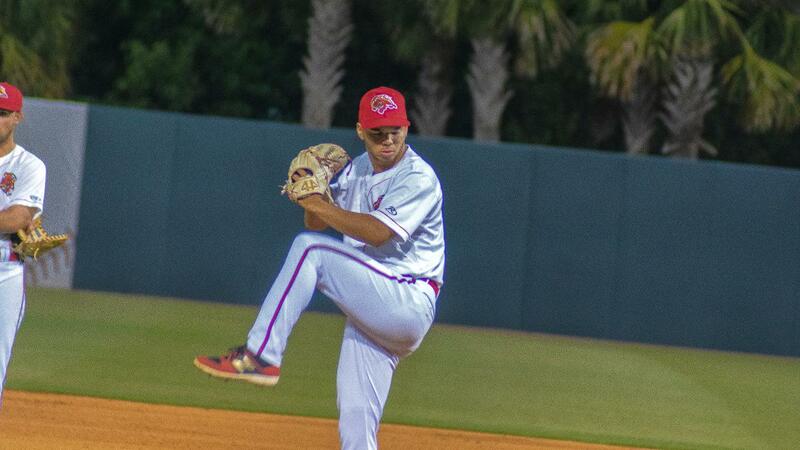 KISSIMMEE, FL: Despite big flies from star Braves prospects William Contreras and Jefrey Ramos, James Nelson had one of his own and another key RBI double to jump the Jupiter Hammerheads around the Florida Fire Frogs, 5-2, on Tuesday evening at Osceola County Stadium. Nelson's two-run bomb to left against RHP Troy Bacon in the sixth proved to be the game-winning hit for Jupiter. He added a key insurance RBI double in the eighth to provide a little extra cushion for the Hammerheads. The contest featured a 1:10 rain delay that stopped play abruptly after the seventh inning wrapped up. It appeared for some time that the game may not continue because the rain came down at such a steady rate. However, the new drainage system held up great and the Fire Frogs were given another chance to try and rally. Instead, it was Jupiter that came out of the stoppage on fire, posting two huge tallies that put the game away. Nick Fortes had a run-scoring single off LHP Justin Kelly two batters after Nelson slammed his RBI two-base hit into the left-field corner, giving the Hammerheads a 5-2 edge. Kelly allowed two hits and two earned runs while fanning five Hammerheads over two innings. Top Marlins prospect Victor Victor Mesa pieced together a three-hit night that included a run-producing knock versus RHP Huascar Ynoa in the third, opening the scoring. Ynoa battled through 3 and 1/3 stanzas, scattering three hits, two walks, a run and four strikeouts. Jupiter mustered just three hits in a three-frame span against Bacon (0-1), but he surrendered the two-run bomb to Nelson which was the biggest blow of the night. William Contreras and Jefrey Ramos each reached base multiple times as part of their big offensive outputs. The Braves #9 prospect was 2-3 with a walk and that long ball with southpaw Braxton Garrett on the hill which evened the game at one in the fourth. Ramos exited the ballpark to lead off the seventh and trim the deficit to 3-2. The Fire Frogs left fielder increased his hit streak to six after producing another 2-4 night. Florida got two men on the bases with the rain coming down in the seventh but couldn't break through to tie or take the lead. RHP Colton Hock's key punchout of Riley Delgado kept the Fire Frogs from inflicting further damage before the delay began. NEXT UP: Florida looks to regroup and get back to its winning ways in the third game of this four-game series on Wednesday evening at Osceola County Stadium. First pitch will be at 6 p.m.